I love the siting of this house. It sits atop a steep slope that overlooks a view of rolling hills. 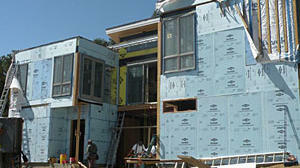 The Breezehouse modules have arrived in Healdsburg! Designer Sharon Portnoy and I spent a day at the site walking through the newly sited home and taking advantage of the natural light to select the home’s Benjamin Moore paint colors.